Japanese Whisky is one of the most sought after liquids in the drinks industry and aggressively rivals its Scottish counterparts in competitions and on the market. Japanese Whisky is seen as cool, hip and very in. In terms of popularity, it’s like orange wine (which has nothing to do with oranges), and barrel aged gin. Everyone in the know wants to get their hands on some and see what it’s all about. Up until now, I’d only had Japanese Whisky on one occasion. It was a very hazy night, but I still remember thinking, this is good! 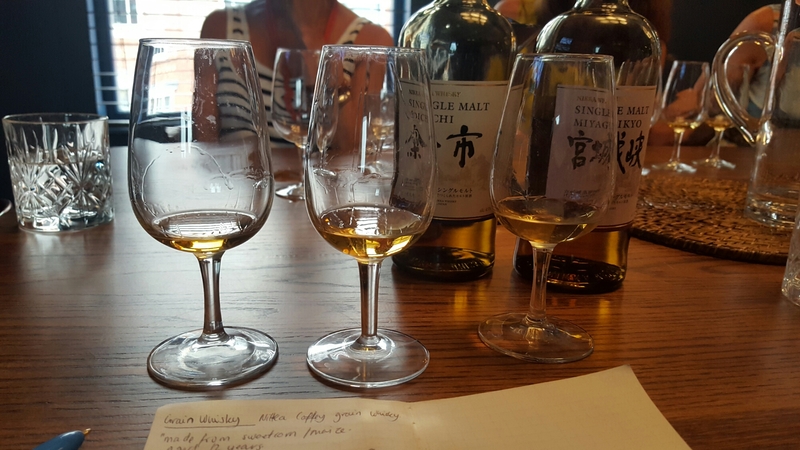 With no prior knowledge of Japan’s very impressive history of Whisky making, I ventured to the Spit Wine and Spirit School’s collabo tasting with Nikka Whisky, to see what the fuss was about. Titled Ladies Whisky Night, Introduction to Whisky, I was super excited to taste in an unitimidating setting. The night was presented by Stephanie Holt, a young charismatic Whisky ambassador with heaps of knowledge on spirits. It was nice to have a chat with her whilst I waited for the other guests. The tasting took place on a Wednesday at the Plough Pub in Harborne. The beautiful upstairs, private dining room seems to be the main hub for Spit’s tasting. Great for me, as it’s walking distance and I can grab a cheeky glass of wine before or after the tasting! Shh! The Nikka Whisky Co was founded in 1934 by Masataka Taketsuru, he is highly regarded as the Godfather of Japanese Whisky. We tried 6 different Whiskies and 3 really stood out as ones to purchase! The first Whisky of the night was the Nikka Coffey Grain, named after the traditional column stills used to produce it. It was a nice Whisky to set the tone of the evening, vanilla, butterscotch, burnt citrus, tropical fruit and coconut. This Whisky was smooth and easy drinking, but in no way simple. A nice tipple for a Whisky beginner. Stephanie recommend also trying the Coffey Grain in a cocktail of coconut water and pineapple, to exaggerate the exotic nuances. The next two Whiskies came as a pair the Miyagikyo and Yoichi, both single malts. We learnt that a single malt was made from 100% malted barley. Miyagikyo was herbaceous, with leathery notes, raisin, dried fruit and honey. I got a very slight smokiness. This Whisky was matured in a Sherry cask. Whilst the Yoichi was spicy, floral and full of brine. I personally would sip this back with fresh oysters, lemon and tobasco! Another favourite of mine was the Nikka from the barrel. A blended cask strength Whisky presented in the cutest bottle. We were also treated to the Pure Malt Red and the Pure Malt Black. I’m happy to say that the ladies class was in no way full of frills and bows! Having really enjoyed the tasting by Spit Wine and Spirits School, meeting new people and learning at the same time I’m excited to sign up for another class. I was invited as a guest of Spit Wine and Spirits School.